Wow, what a wonderful reception to come back to! Thanks everyone! Firstly, that picture I showed you last time is a giant slice of cake with eyes! The dark pink is jam between the layers of sponge, and the light pink is icing. 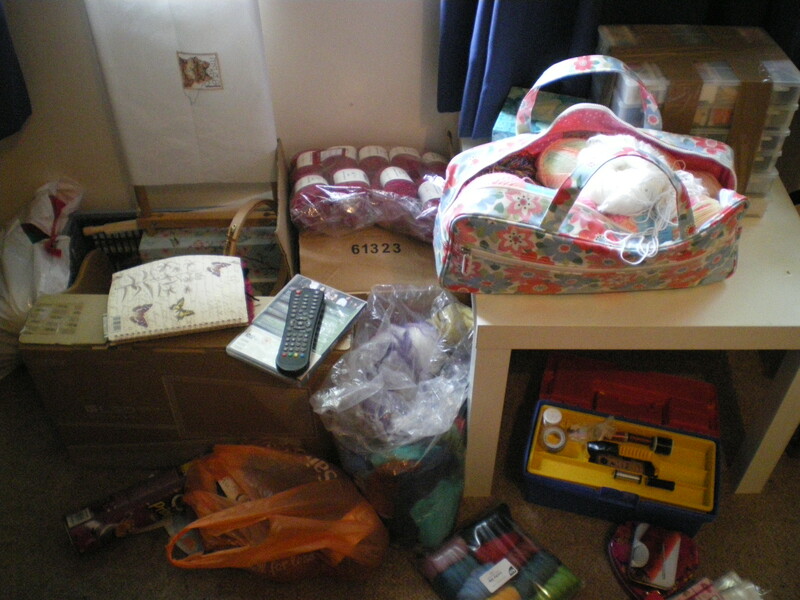 The top drawer is misc and cross stitch, the other two drawers hold knitting yarn. 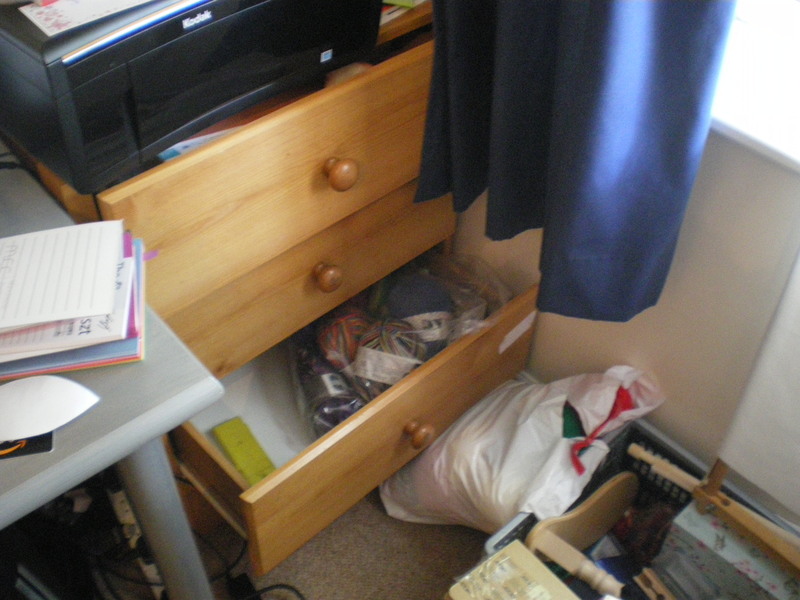 Not all of it though, as you can see of what’s storied outside of the drawers! 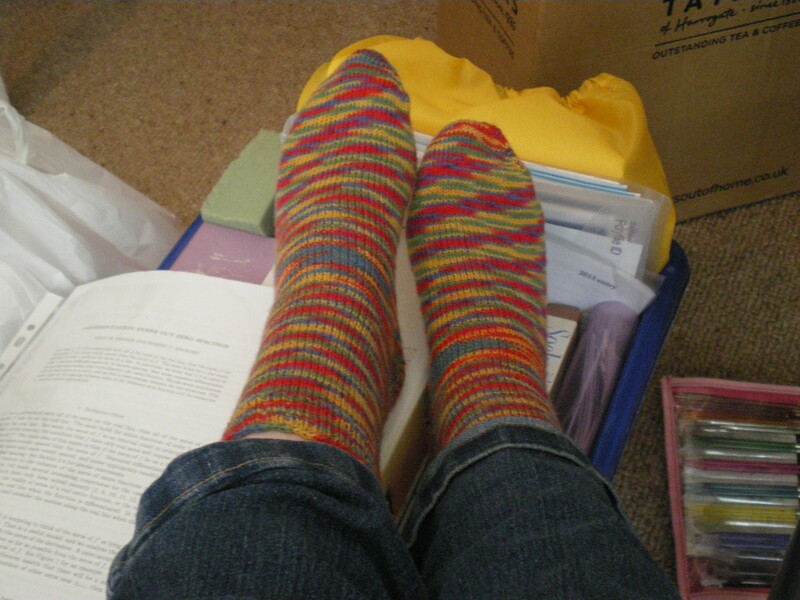 No more yarn for me for a while I think! Not that that’s going to be too much of a problem, as I’ve started making my own! 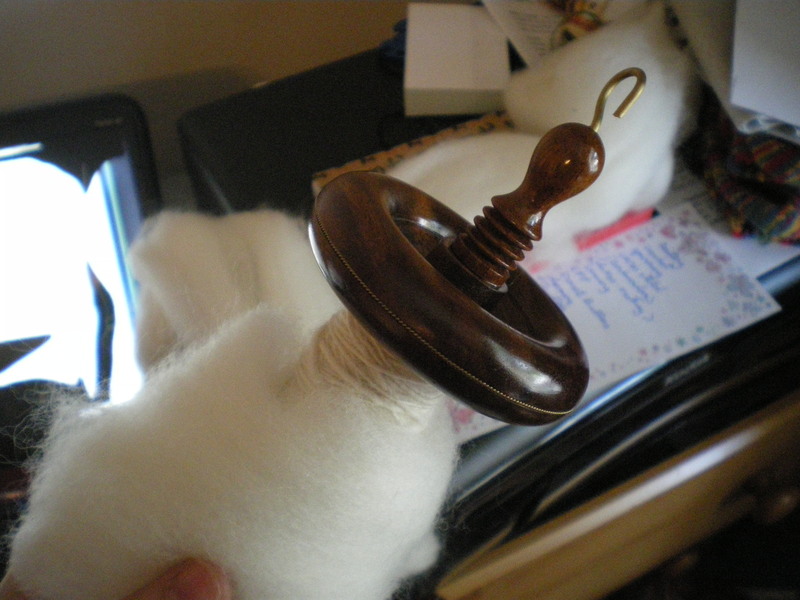 Meet John, my first drop spindle. I’ve also started a scrap blanket to use up all my sock yarn scraps from socks. Can you recognise the yarns used so far? I’ve done more work on my knitted cardigan, but that totally deserves a post of its own, so that’ll come along later on! 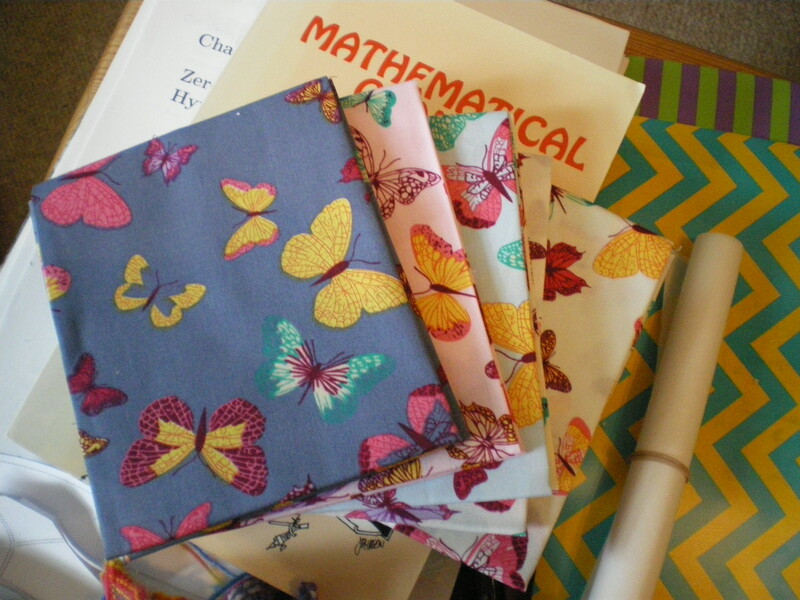 Another thing I can’t share just yet are Christmas plans- I’ve changed my mind about what I’m doing again, now it involves sewing. But I think that one of my friends is planning on reading this soon, and she’s getting a Christmas present, so that’ll need to be hush-hush until Christmas! 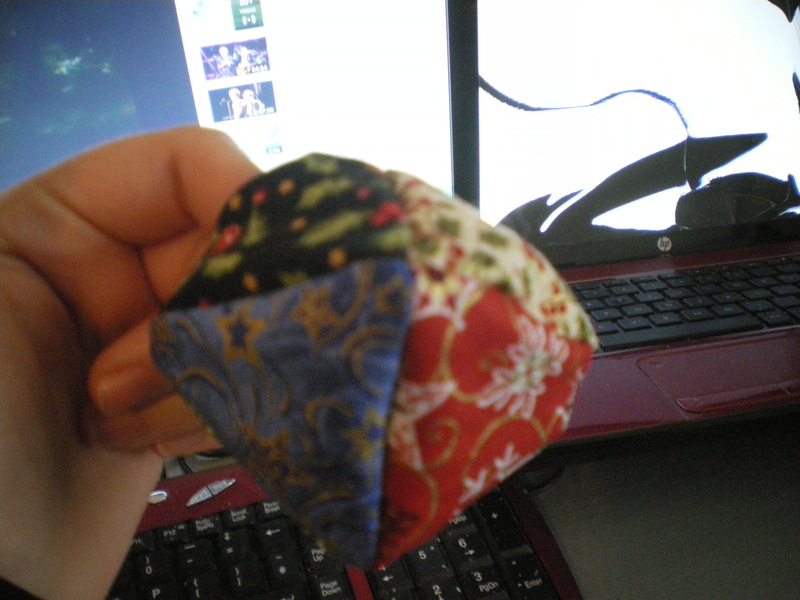 Although, speaking of Christmas, I have started sewing some Christmassy juggling balls, so here’s one ready to be stuffed! With my mum’s sewing machine! 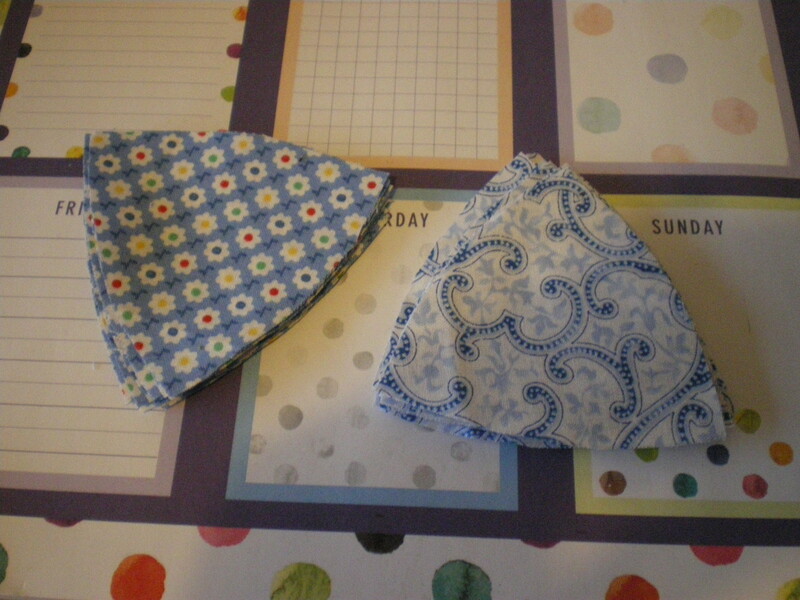 I’ve managed to sew the main pieces of a dressmakers dummy pin-cushion. It doesn’t really look right, but I’ll chalk it up to experience and maybe make a better one next year. And the year after…I might start a trend here! 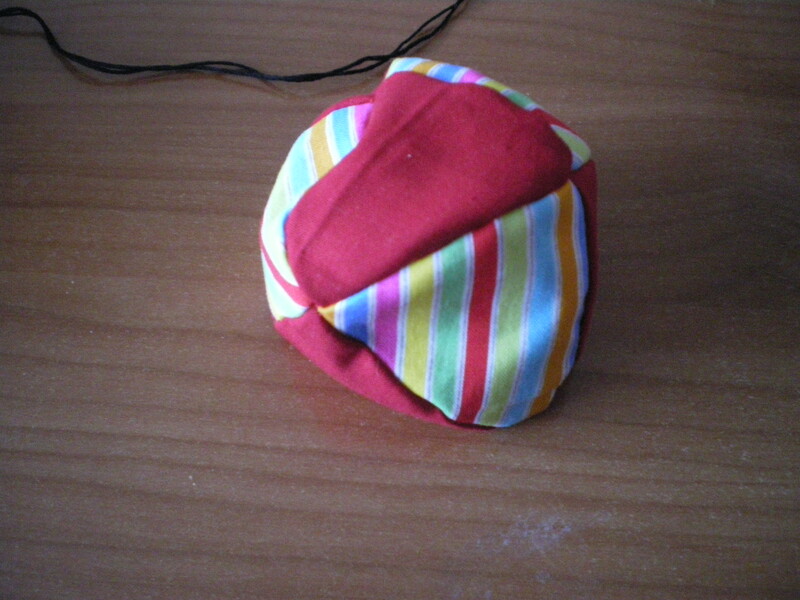 This pattern comes from here. It’s a video tutorial, which I found a little annoying, but it’s well explained and the printable is a pdf directly underneath. Now I’ve made it, and brought it back up North to stuff, it needs to do South again so I can borrow the glue gun to finish it! Talk about long-winded! 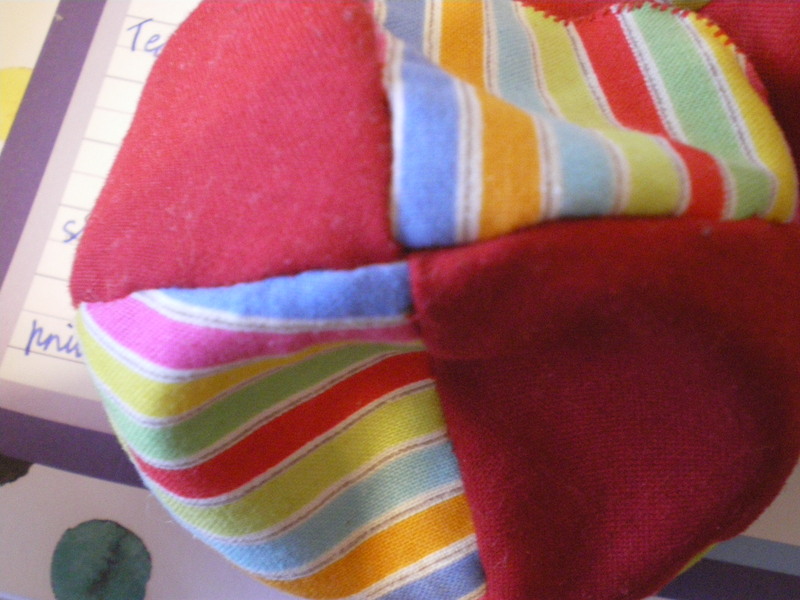 I also sewed two triangles together, and then hand sewed it into a little container. 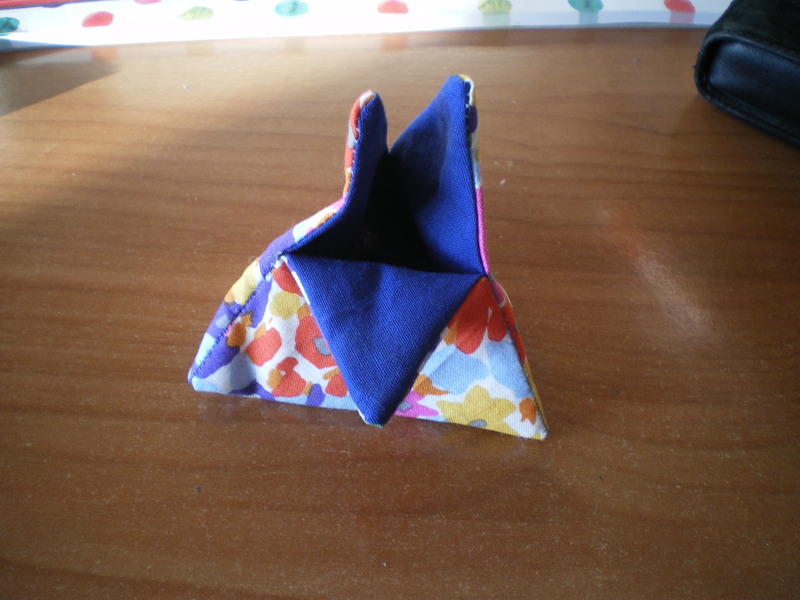 This is going to be an ort container, and I have some buttons to sew onto the fold over bits. 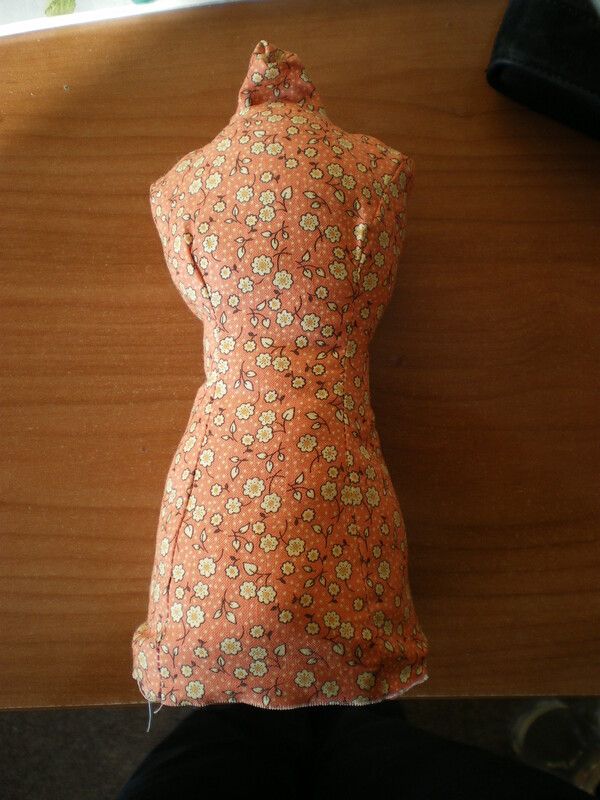 This pattern comes from here, and I’m really tempted to make myself one as well! They’re just so cute! I keep forgetting to mention, so I’ll stick it here. There’s a pdf with a load of different juggling ball designs, here. 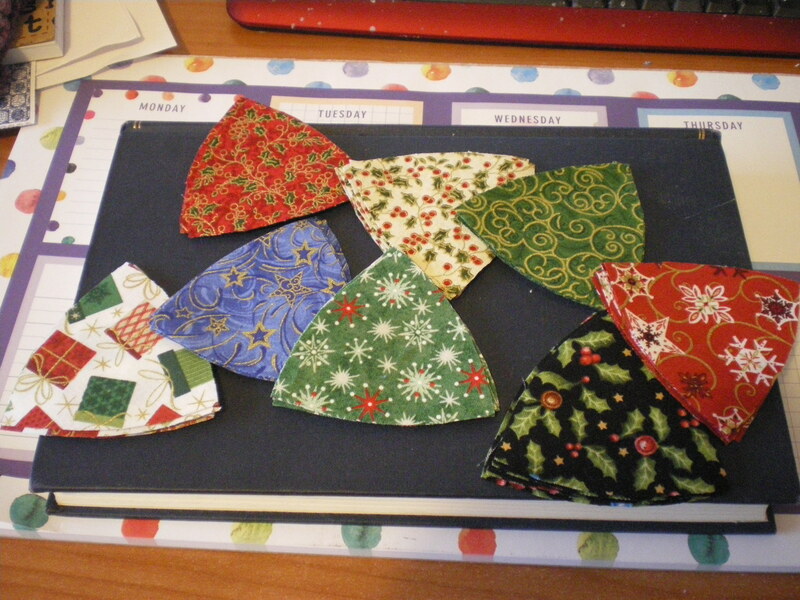 So far I’ve only made the 4 and 8 panel shapes, but after stitching all these, I may try some of the others. They’re excellent palate cleansers, between larger projects. 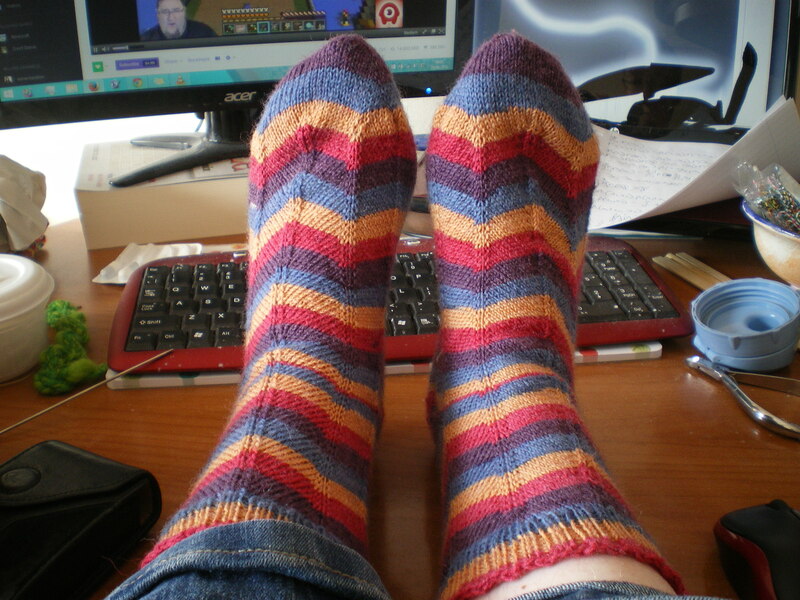 Making them matchy-matchy was a challenge, but great fun 🙂 I’ve got this yarn in a darker shade (it’s heart and sole) to do a pair in the same way- toe-up matching jaywalkers, but first I needed a break from matching, so I’ve started another completely different pair. 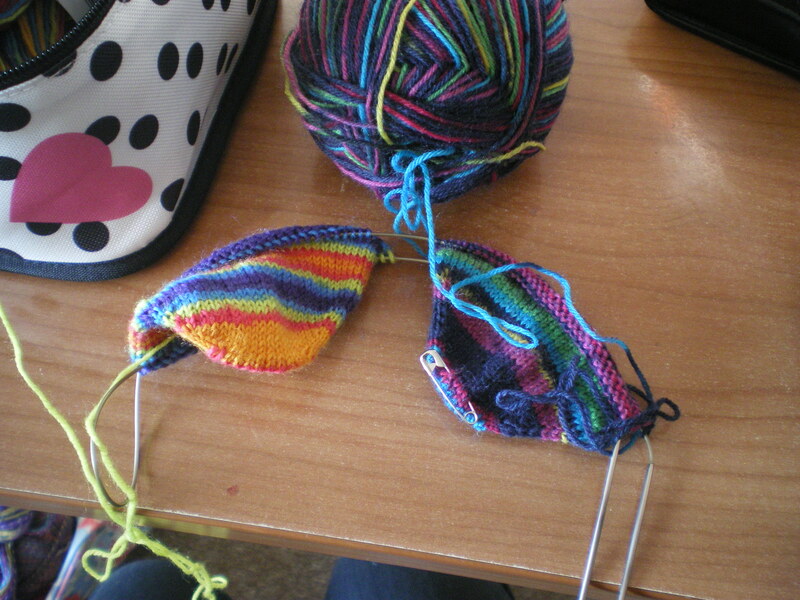 One of them matches one I’ve already knitted, so I’ll get a pair and an odd sock out of this 🙂 I picked up the other yarn when I was in town…I have no idea how the yarn is patterned, which makes it great fun and a lovely surprise as I knit. No doubt sooner or later I’ll get a repeat, which will spoil it somewhat, but hey ho! 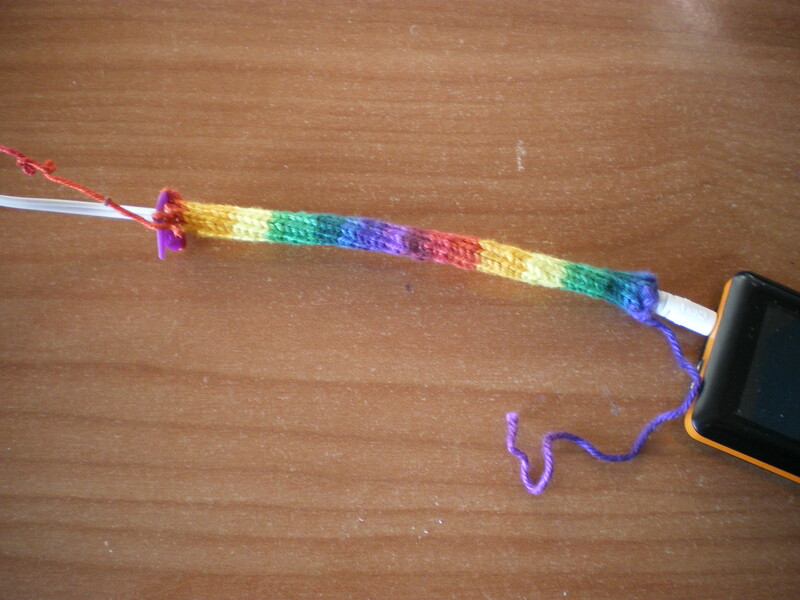 I also started knitting a cover for my ear-buds. 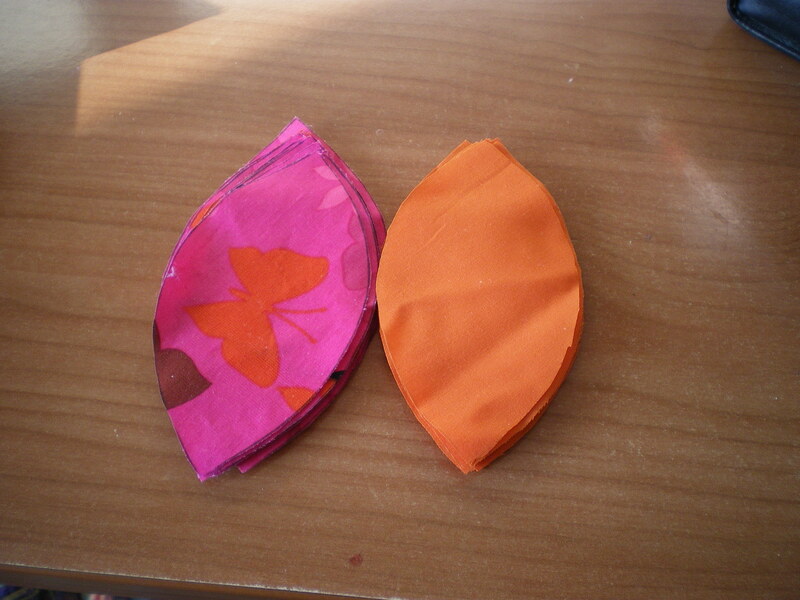 I’m using cotton sport-weight, and my 1.5mm Karbonz. Yes, I am slightly insane 🙂 It’s taking way longer than I thought it would (big surprise 😛 ) but I’ll get there. I’m loving the colour repeats on it, so it’s all good! So what have you all been up to over Easter? Any tips for getting back into working mode after the holidays? Last week, I got my order from Deramores *squeal*. 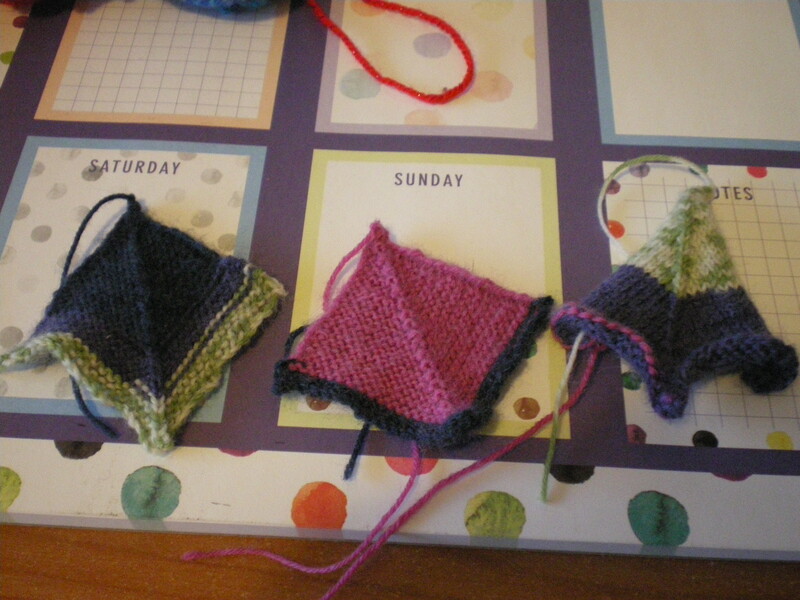 So the square on the right is the same, but in stocking stitch. Having tried this one, I don’t like it. It’s not square, and rolls too much for me. 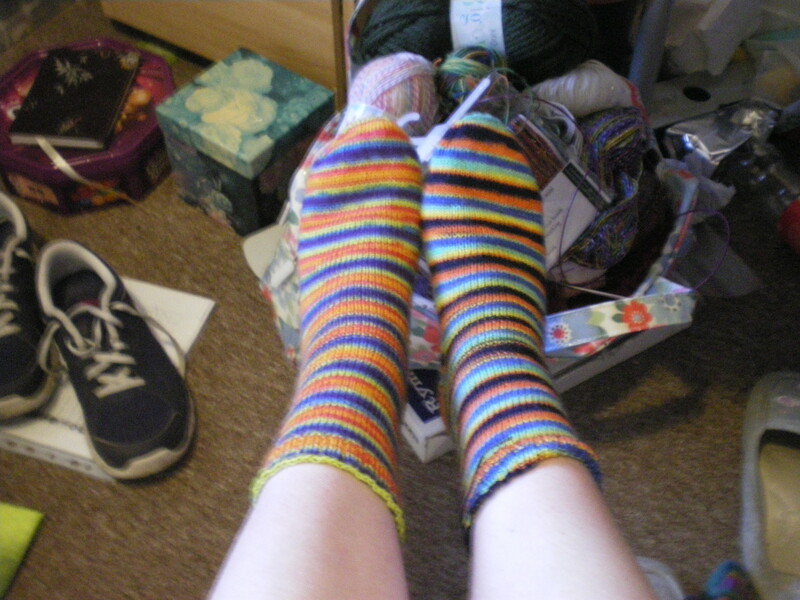 Of course, I need to finish my other blanket before I start this one… *whistles innocently*. Seriously though, I really want to finish that other blanket. 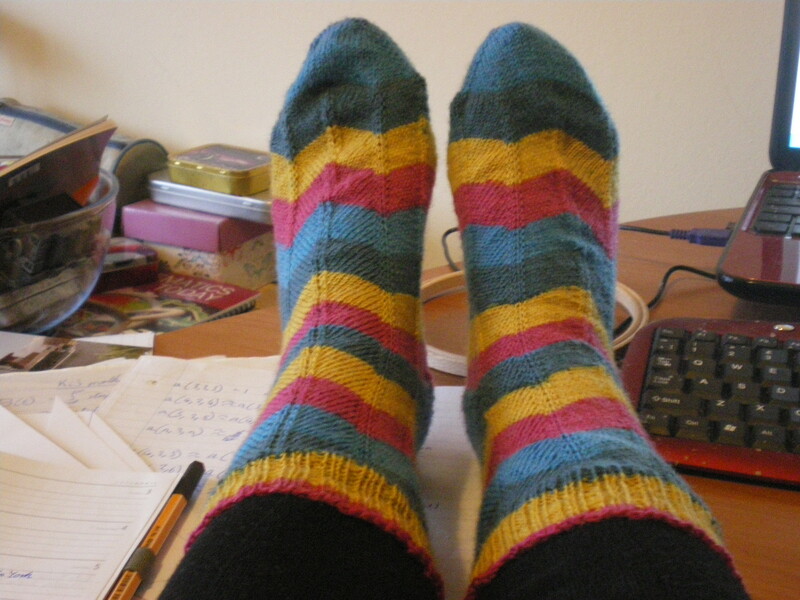 FO Friday- finally I manage it! So for once I actually manage to both have something finished and post about it on Friday! 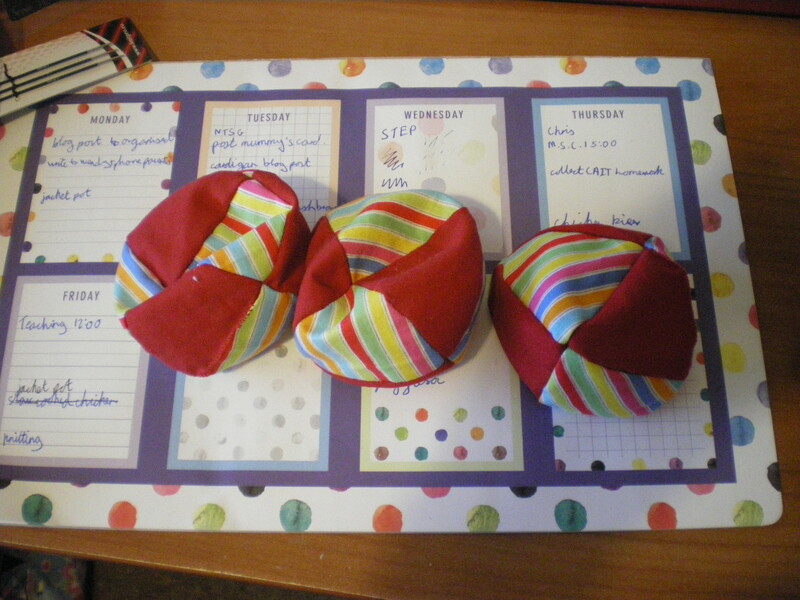 I finished my juggling balls!!! but some leave something to be desired. Ahh well, I clearly need lots more practice!! I finished the cat, and it’s absolutely gorgeous! 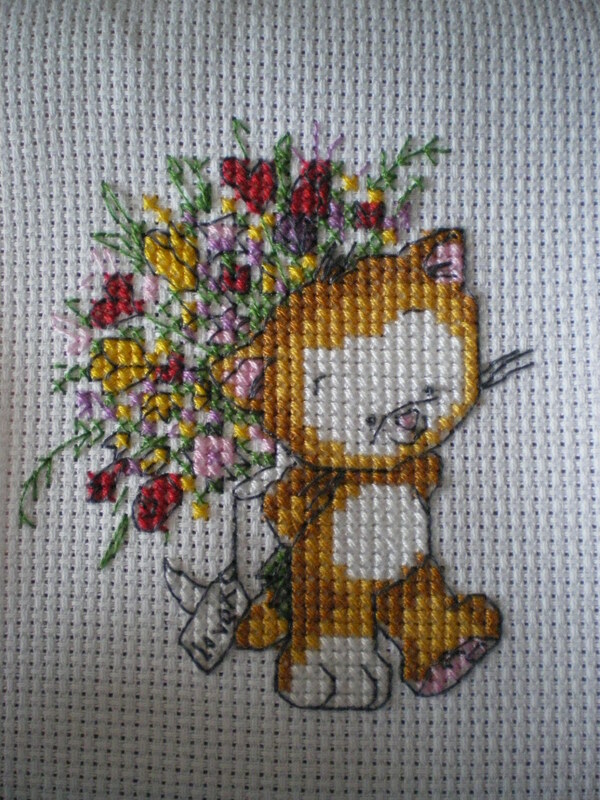 I want to make loads of these now, with different cat styles. 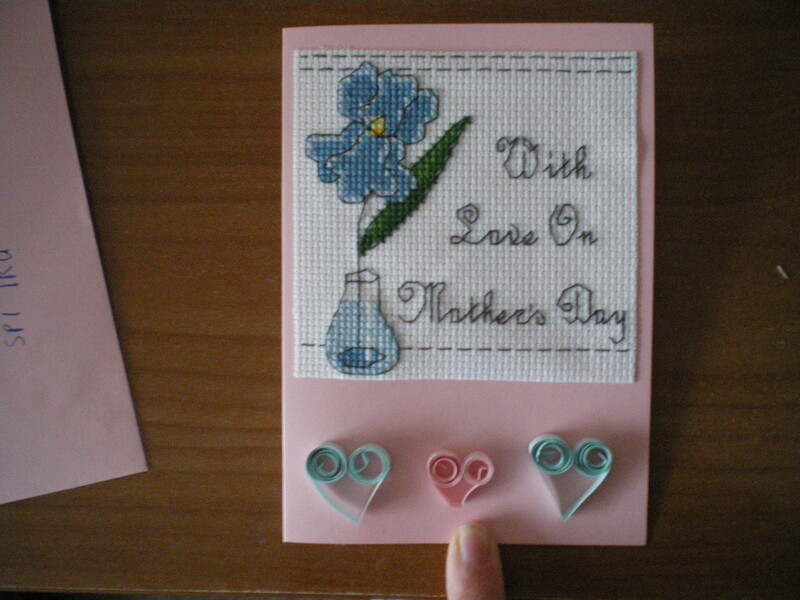 They’d be great stash busters 🙂 And then I remembered how much confetti/backstitching there is, particularly in the flowers, and decided I needed to lie down until I stopped wanting to do that! So, this morning I received the next part of the OUAT sampler, so that’s what I’ll be working on this weekend! After giving out too many clues last month, this month I’m going to be a lot stingier! Don’t worry, it’s a well known fairy tale! It was written by a French man, and it was included in the Grimn brothers fairy tale collection (not surprising given the level of violence in it!). Over the years it has been re-written, and watered down many times. The most notable ‘sanitising’ changes the fate and behaviour of the main bad guy. In the original version, he ate the main character, and was later cut open (thereby releasing the main character) and stuffed full of rocks, which killed him (but y’know, the cutting open? Totally fine! ), but later versions has him merely lock the main character in a wardrobe or some such thing, and then get chased off by a supporting character! Let’s see what you make of that, and next week hopefully I’ll have finished the cross stitching which will probably give the game away a little! The other day I was in town, and I found this absolute gem of a book. I had to look online at when it was published (1947!). 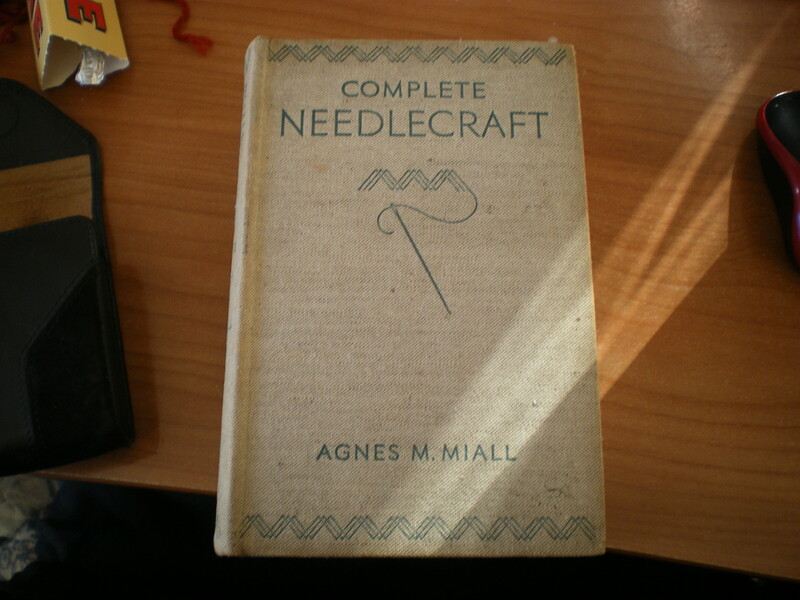 It’s a general book on embroidery, knitting, crochet, dress making and home upholstery! It’s lovely to look through, especially when it says things like ‘Tweezers […] Buy the ordinary small toilet kind from the sixpenny stores.’! 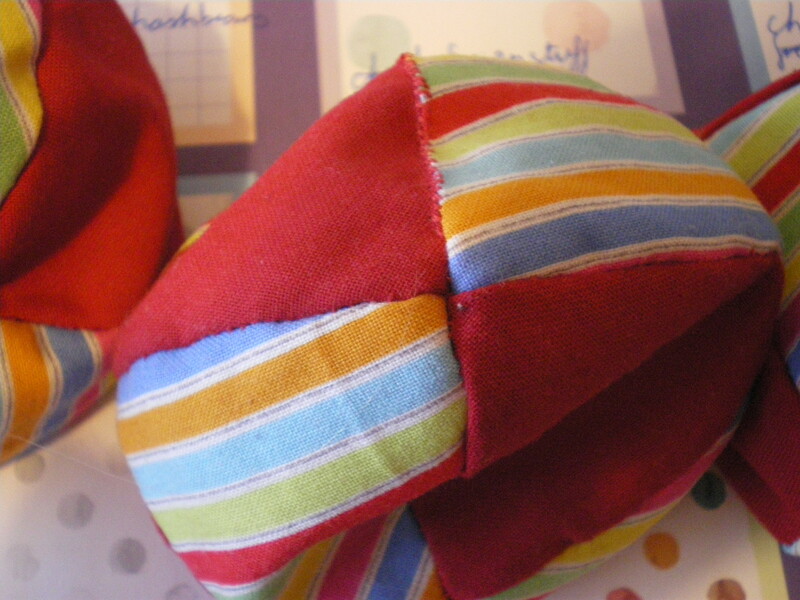 I’ve also done a couple of lines of stitching on my juggling balls- not very much, but there’s no rush! 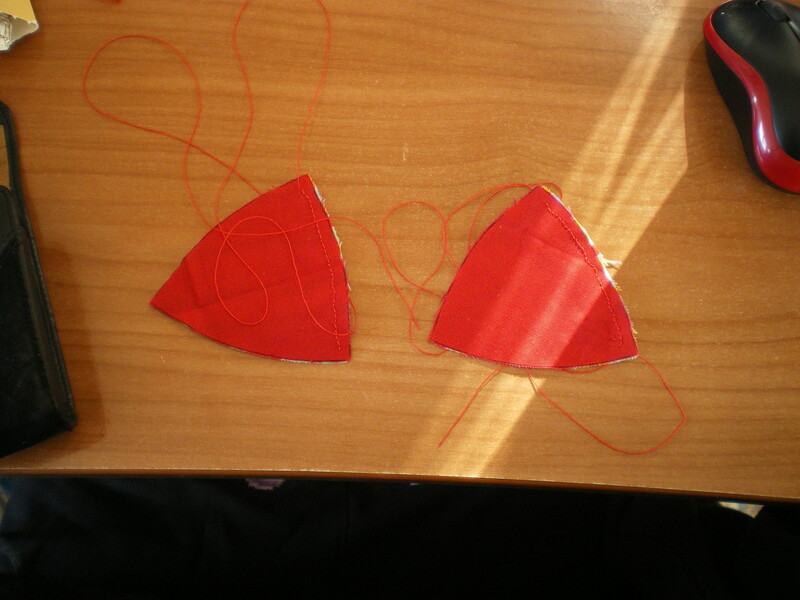 So now I can sew these bits together, and I’ll have half a juggling ball! Which is probably going to have to wait until December, because of the jumper! 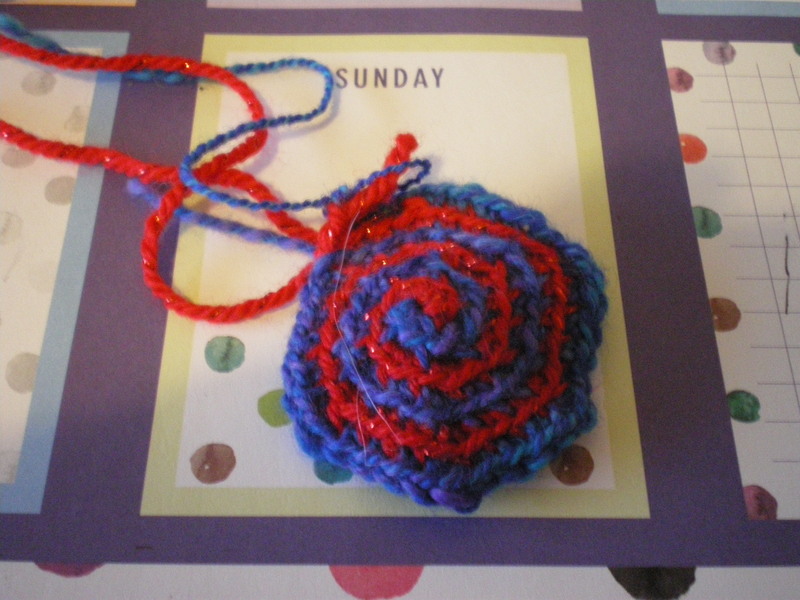 I might have slightly cheated and started it yesterday… but who really minds? I’m not going to be working on it this weekend because of OUAT, so it all works out :). 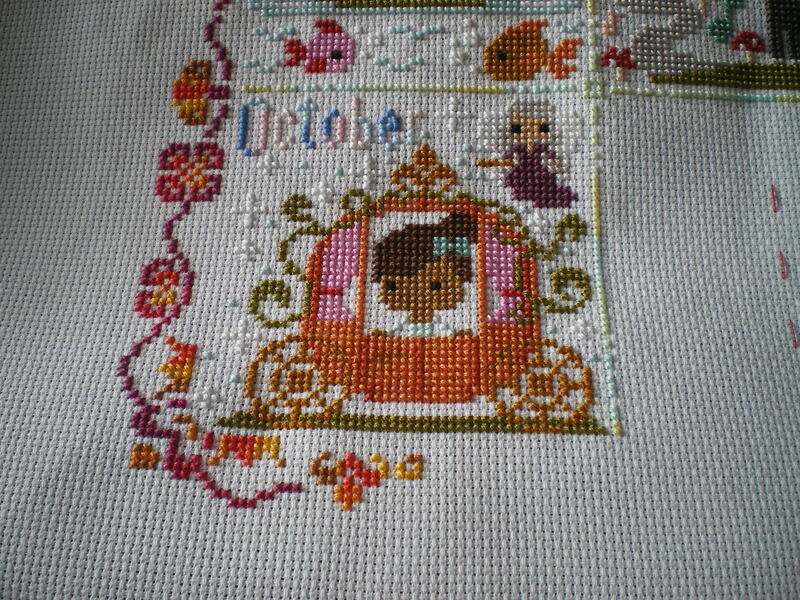 Firstly, I finished October’s block- it feels very strange that I’m onto the bottom row now! And… that is unfortunately pretty much it I’ve been busy working this week, and that’s going to keep stealing all my time until Christmas. On the other hand, I’m now teaching again, so yay for that! 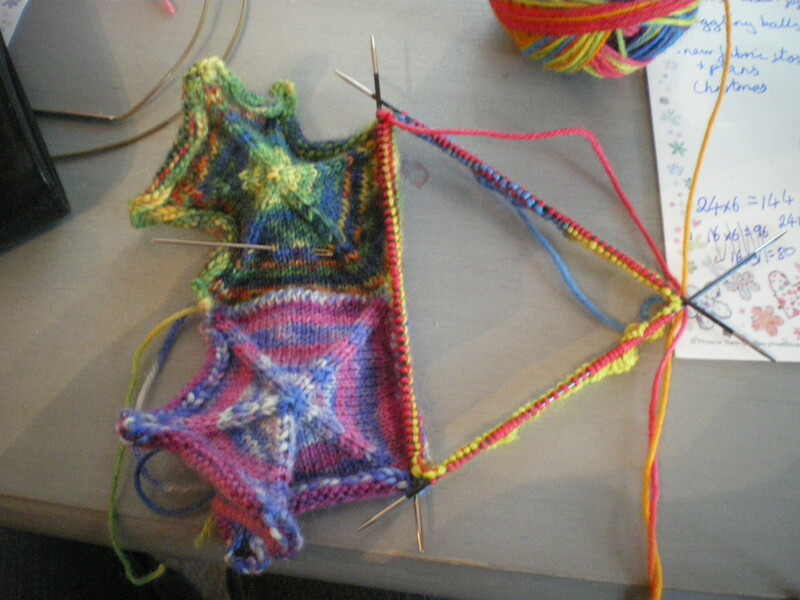 I have joined a couple of clubs here, so hopefully I’ll still get some knitting done on a Friday when knitsoc meets up (as long as I remember my cabling needle…doh!). 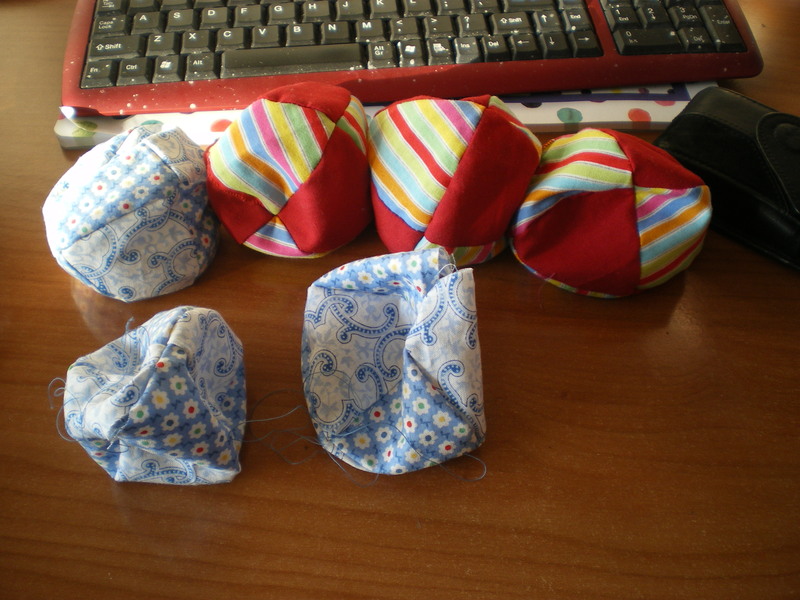 I also joined jugglesoc, and am planning on making my own set of juggling balls, which should be fun 🙂 So far I’ve outlined my shapes, and so hopefully I’ll get around to ironing and cutting them out this weekend, when I’ve had enough of Stained Glass! 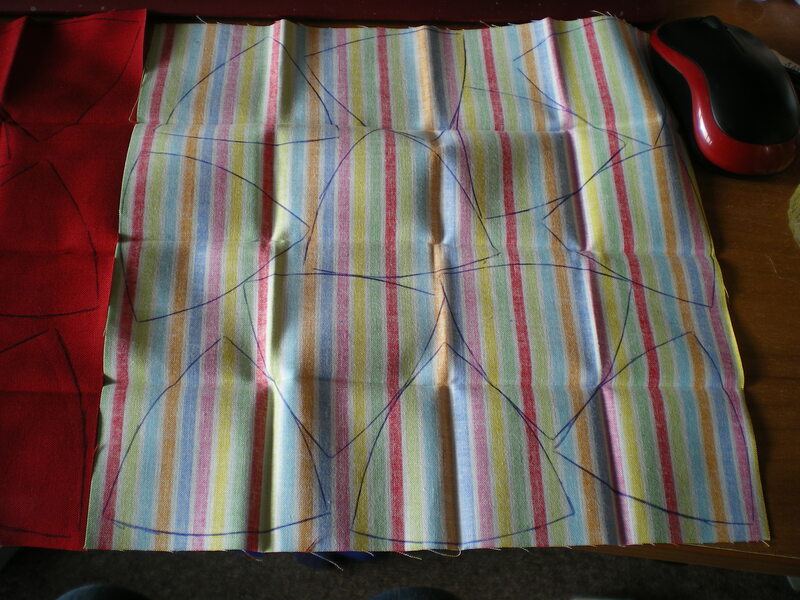 Hmm, I wonder if I can finished the page of Stained Glass this weekend… better get my speedy needle out!